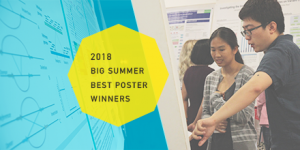 This summer, the Institute for Quantitative and Computational Biology (QCB) hosted the Fourth Annual Bruins-In-Genomics (B.I.G.) Summer Research Program. On August 17, 2018, the UCLA community gathered at Hershey Hall’s Grand Salon to view the results of our 41 students’ research projects, which culminated in 27 spectacular scientific posters. B.I.G. Summer is an 8-week full-time immersion program for undergraduates interested in learning how to read and analyze genes and genomes. Through this program, students have the opportunity to experience graduate-level coursework, and learn the latest cutting-edge research, tools and techniques used by leading scientists to solve real-world problems.